When Fat Albert and the Cosby Kids debuted in 1972, I was all of five years old and in the animated series’ target audience – I guess. I think five was about the right age for the show; though it would appeal to older kids as well – and was probably meant more for them – it still worked for little ones. Culturally, whether I fit the Albert target audience seems more questionable, as a show about poor inner city black kids might not sound intended for a middle-class suburban white boy. I don’t think any of that mattered, though. I never viewed the series in racial/societal terms; I just thought the adventures of Fat Albert and his pals were funny. I doubt I’ve watched Fat Albert since Jimmy Carter was in the White House, so I was curious to give it a look – a curiosity encouraged by the release of Fat Albert and the Cosby Kids: The Complete Series. 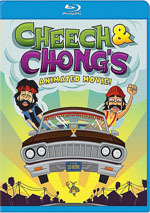 This 15-DVD set includes all 110 episodes of the series across its three different incarnations. 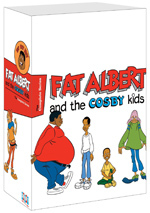 The original Fat Albert and the Cosby Kids aired from September 1972 through October 1976 and covered 36 episodes. 14 of these arrived in the fall of 1972 and eight more came in fall 1973. After no new material in 1974, six programs encompassed Season 3 in 1975 and the series finished with eight Season 4 shows in the fall of 1976. The franchise left the air three years before it returned as The New Fat Albert Show. It included 24 episodes and went from September 1979 until September 1981; it spanned three eight-episode “seasons”, with one each autumn. Finally, The Adventures of Fat Albert and the Cosby Kids arrived in September 1984. While the two prior series ran exclusively in the fall, this one presented 50 shows over a year, as each week delivered a new episode until it ended with the August 10, 1985 broadcast. Despite the different incarnations, the format/premise remains the same across all three series. 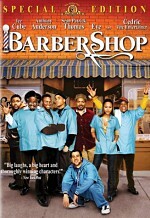 Set in Philadelphia, the franchise loosely bases the characters and situations on those creator Bill Cosby experienced in his youth, though it presents them in then-current eras; it’s a period series now but that wasn’t the case when the shows first aired. We spend a lot of time with a representation of Bill himself and his younger brother Russell as well as friends Fat Albert, Rudy, Dumb Donald, Weird Harold, Bucky and Mushmouth. Essentially the stories show the daily lives of the kids while they encounter scenarios that always end up in a lesson of some sort. Though I normally watch the DVDs I review in their entirety, the enormity of this package made it impractical. To ensure I’d not need to spend a month with the set, I chose to check out one episode per disc, so I examined a total of 15 shows. Even over the span of 13 years, these remained pretty similar in execution. The programs would mix slightly sassy comedy and inevitable moral lessons. Intended as an educational series, Albert always teaches the viewer something, and with 110 episodes at its disposal, it touches on a wide range of topics such as fears of doctors/hospitals, bullies, respecting authority and so on. As a kid’s program, I think Albert holds up pretty well. While not exactly edgy, the series’ humor proves to be surlier than one would expect from Saturday morning fare. The majority of the gags revolve around contentious relations among the various kids, so we get a lot of insults hurled among the characters. These don’t become especially cruel, but they still deliver a certain insolence one doesn’t usually get from this kind of show. As far as the series’ moralizing goes, it can be a bit heavy-handed – or at least that’s how it seems from an adult’s perspective. I suspect kids won’t see it the same way, and even as a grown-up, I think the shows avoid too much preachiness. The programs come across as glib enough to help the lessons go down painlessly. Fat Albert comes across as much less dated than I expected. Yeah, some of the hairstyles and fashions show their eras, and a few of the scenarios reflect the 70s/80s as well. Nonetheless, there’s not much about the humor that doesn’t translate, and a lack of then-modern cultural references helps the series age well; at least in the programs I watched, Fat Albert didn’t attempt to be especially topical, so the bits don’t date it. As a kid’s show, I think Fat Albert still boasts a lot of merit, but I find it tougher to recommend for adults. I can’t fault Cosby and company for that, as they never intended the series for grown-ups. Nonetheless, Cosby’s presence might elevate expectations that Fat Albert can please adults as well as kids, and that’s not terribly true. This doesn’t mean Fat Albert becomes a chore to watch for a grown-up, however. Indeed, the shows seem considerably more enjoyable than the average Saturday morning fare; most of that stuff is relentlessly inane, whereas Fat Albert comes with a reasonable level of cleverness. It’s just not a series that works especially well on an adult level; grown-ups can take mild entertainment from it but probably won’t really dig it. I definitely don’t see that as a flaw, though, and as a nostalgic exercise, I enjoyed my time with Fat Albert. No, I didn’t derive a ton of amusement from it, but I think the series remains a high-quality combination of entertainment and education for elementary age kids. This was a solid series in my youth and it continues to hold up well. Fat Albert appears in an aspect ratio of 1.33:1 on these DVDs. Due to those dimensions, the image has NOT been enhanced for 16X9 televisions. The programs showed their age but remained watchable. Like everything else, sharpness seemed erratic. Episodes from the first season suffered from the worst definition, as they tended to be rather soft and fuzzy. Matters remained up and down after that, as we’d go from one pretty accurate show to another with iffy clarity. Most of the shows looked decent, though. Just small issues with jaggies or shimmering occurred, and I saw only modest signs of edge haloes, though these became more notable during the New Fat Albert shows. Print flaws were fairly minor. I figured we’d get a fair number of specks and spots, but those cropped up less often than I anticipated – and were sometimes due to poor clean-up animation more than anything else. I did still see a few marks, hairs, lines, streaks and other blemishes, but the shows usually looked reasonably clean. Colors tended to be average. Even though the series boasted a potential lively palette, the shows featured fairly mediocre hues; they weren’t dull but they didn’t offer much pep. As with definition, the colors did become more dynamic as the years passed, but they never looked especially vivid. Blacks demonstrated decent depth, while shadows offered acceptable smoothness. These episodes reflected their source and showed decent visuals. Don’t expect much from the bland monaural soundtrack of Fat Albert - and unlike the image, the mixes never really improved. The audio came mastered at a rather low level and lacked much range. Music sounded thin and wan, while effects worked about the same way; they could be a bit distorted and display little punch. Speech was intelligible but not much better. The lines showed a little roughness at times and seemed tinny much of the time. Nothing here came across as bad for its age and roots, but the audio remained pretty lifeless. The main extra found here appears on DVD 15. A documentary called Hey Hey Hey… It’s the Story of Fat Albert runs 40 minutes, 27 seconds and includes comments from series creator/actor Bill Cosby, storyboard artists Darrell McNeil, Tom Tataranowicz, and Michael Swanigan, educational consultant Dr. Gordon Berry, writers Larry DiTillio, Rowby Goren and Robby London, and editor Rick Gehr. We learn about the series’ origins and development, character and vocal design, cast and performances, story/educational areas, the program’s impact and legacy. With 40 minutes at its disposal, “Story” delivers a decent take on the series. It doesn’t provide s tremendous amount of depth, but it covers logical areas in a fairly efficient manner. While not exhaustive, “Story” gives us some good insights about the show. The set also provides a 16-page booklet. In addition to art and disc credits, it includes an essay about the series from Dr. Gordon Berry. Nothing remarkable pops up in the booklet, but it’s a nice complement to the package. Note that the DVD’s press materials claimed the set would feature some audio commentaries from Bill Cosby. Unless these are hidden somewhere, they don’t appear. That’s too bad, as I looked forward to the Cosby commentaries. A staple of my childhood, Fat Albert and the Cosby Kids still holds up pretty well after many decades. It’s not terribly entertaining for adults, but it’s a good show for children – and pleasant enough for grown-ups as well. The DVDs come with erratic but generally acceptable picture/audio along with an interesting documentary. This extensive package boasts a good mix of amusement and education for the elementary school kids.